More than a family celebration, Christmas is a time of joy and love in our hearts. Christmas is the time when we all want to be together and calm, it is a day that many long to be at the table with the family sharing a special dinner. Christmas is the most opportune occasion to express our feelings and happiness that you feel when sharing this date with them. Christmas Eve is happiness for people of all ages, for all people. Is it approaching Christmas and you want to wish happy holidays to a close friend? So the following article will help you, we share with you a list of phrases for friends on this special celebrations, you could send them to your friends like writing them on their Facebook walls or use them as sms, please be sure that if you send them it will be happiness for them and for yourself. – The date which commemorates our friendship is always Christmas, is a time of love and spiritual rebirth; I hope you have a very happy Christmas dear friend. – In this beautiful Christmas I wish you would spend a happy evening with your family and all the people who love you. Merry Christmas for everybody. – That the holiday spirit joyful your hearts, Christmas means love, peace, joy and hope for a better world. – In this night, allow the magic of Christmas get your soul to let you feel happiness and you would enjoy the company of the persons you love, besides thanking God. Happy Christmas. – The city looks brighter when it get the Christmas season, not by the lights and the ornaments but by all people that have a beaming smile on their faces and love each other like a big family. Happy holidays. – The reason why Christmas is a very important date is because I can share joys with my friends, I wish everyone Merry Christmas. – Let this Christmas becomes the best of all, by doing things that please the child God , by helping those who most need it and your soul will have happiness and peace. – On this special night I will have all of you with me and I am sure that the child Jesus would fill you with blessings. Merry Christmas dear friends. – The children are happy playing on the streets and families are happy sharing, Christmas is very beautiful, be happy tonight. Happy Holidays. – Being able to express my feelings for my best friends and receiving their love and having my family are the best gifts for Christmas. Happy Christmas. – Let us leave our mistakes, let’s change sadness and sorrow feelings for happiness and joy at the arrival of the baby Jesus. Merry Christmas to all of you. – The world would be totally different if we celebrate Christmas every day, as it is a day full of peace and love for all people. Merry Christmas for everybody. 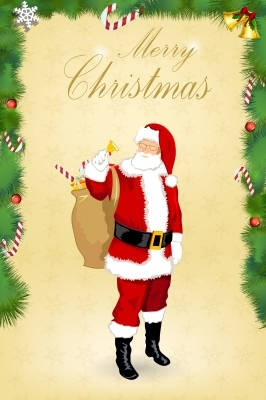 You can share these phrases for Christmas with your friends and with all people you love. Christmas means happiness for everybody.